Federal workers make twice as much as workers in the private sector. While the rest of the nation suffered through Obama’s first year in office, government workers increased their salaries by over $30,000 in 2009. The average federal employee makes as much as a Microsoft employee. 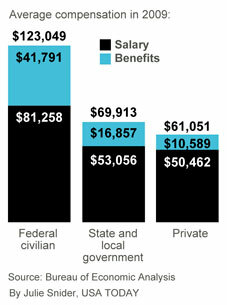 The average federal government employee receives a salary of around $75,000 per year. With present and future fringe benefits equal to about 76 percent of salaries, that makes for total annual compensation of around $133,000. How does this match up to the private sector? CNN Money has a nice survey of the 25 highest paying companies in the country, outlining the average total compensation per employee in each one. According to CNN, the closest match to federal employment is Microsoft, whose average employee compensation is 133,023 per year, making it the 17th highest paying company in the country. More… 77,000 federal employees made more than governors last year.